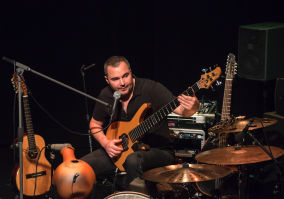 Stracho Temelkovski honours his Macedonian origins in his new musical project from solo to trio, The Sound Braka : a unique musical universe mixing Balkan sound and jazz, creating a genuine bridge between academic and traditional/folk music. His first album will be released by Cristal Records / Sony Music in the fall 2019. Performing simultaneously rythms and melodies (percussion, beatbox, bass, mandole, viola), Stracho Temelkovski is impressive. His music is a journey, lively and sensitive. He is on stage alone or accompanied by musical talents such as Jean-Marie Machado, Jean-Charles Richard, Jean-François Baez among others.